We're leaving Croatia today! 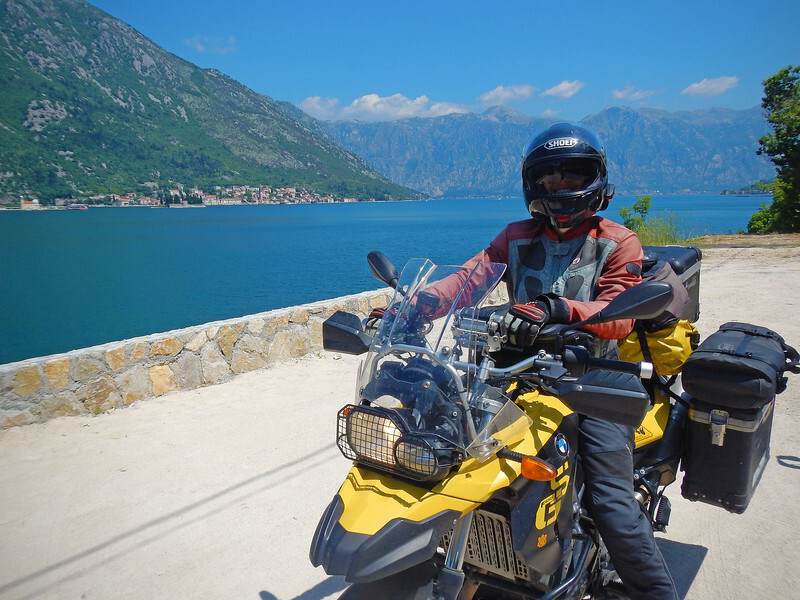 We've spent the last two weeks lazily wandering down the Adriatic coast. Our pace and the weather have been awesome. 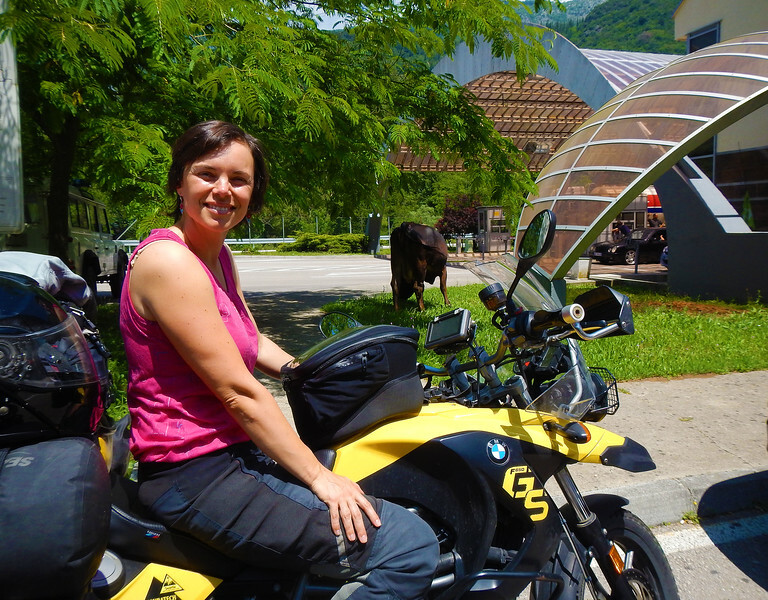 This has been on Neda's bucket list ever since she started riding motorcycles. 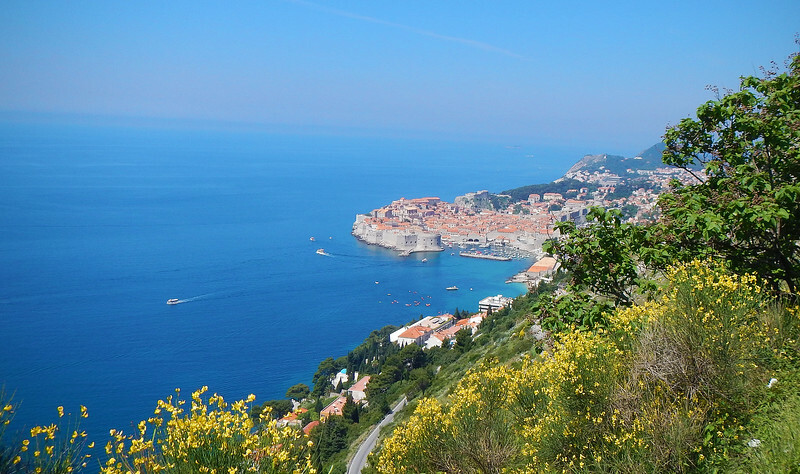 Looking back at the photos, she remarked, "Croatia is beautiful! I'm so proud of my country!" I had started a conversation with him the other day when I was walking by and he was starting up his bike. It had the same clacking sound on ignition that Neda's bike has. "Cam Chain Tensioner", I offered. To my surprise, his English was very good and we chatted about KTMs and BMWs and about our trip for a while. Dubrovnik in our rear view mirrors. Farewell, King's Landing! Along the way, we pass a a convoy of funky-coloured Renault 4s from the 60s. Some kind of car club. The sign on the sides of the cars read, "Enjoy Croatia!" 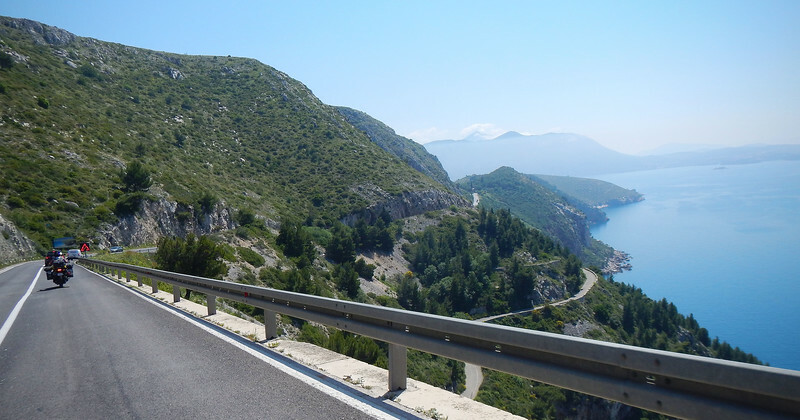 The back reads Konavle, which is a small region south of Dubrovnik, which is where we're currently passing through. So they must be locals out enjoying the nice roads and amazing weather. Neat seeing cars that you don't find in North America. In Croatia, they called these 4s, "Mali Div" (Little Giants) or just "četvorka" (4). I'll have to e-mail the insurance people to physically mail me the originals when we re-enter the Schengen Zone again. 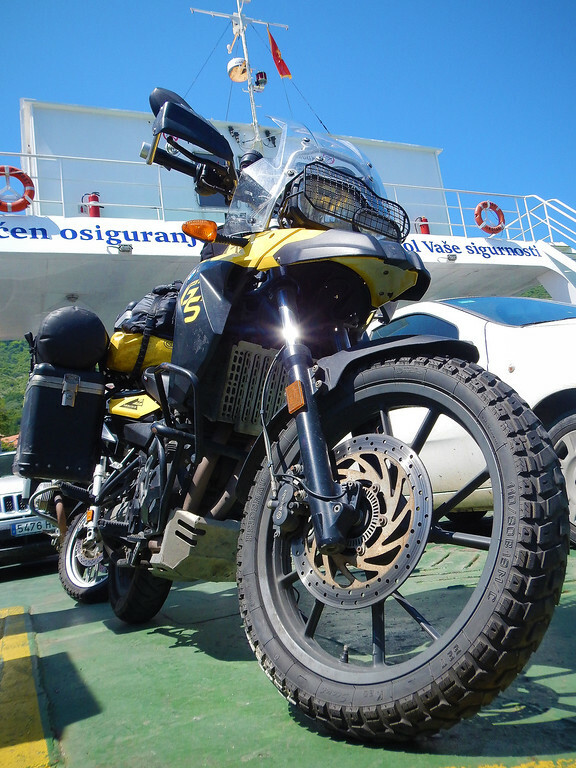 By contrast, Montenegro vehicle insurance was a snap. 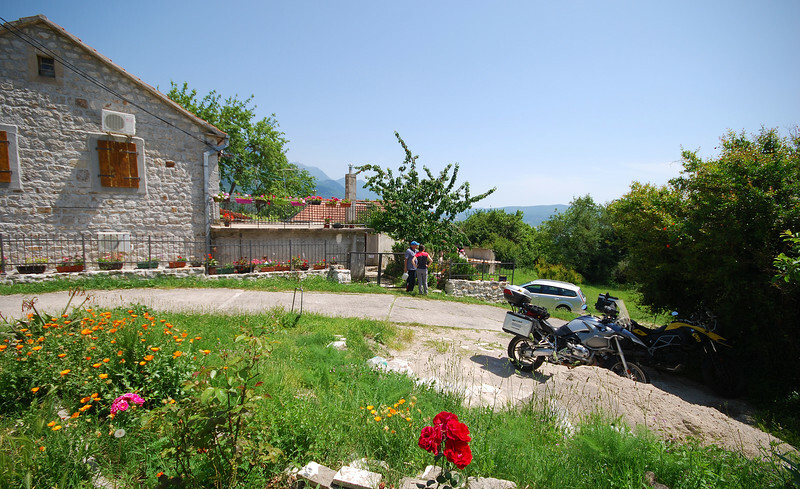 The border official on the Montenegro side held onto our passports and pointed out the insurance office down the road. We walked in, paid our €10 for 14-days of coverage, showed him the receipt and got our passports back. 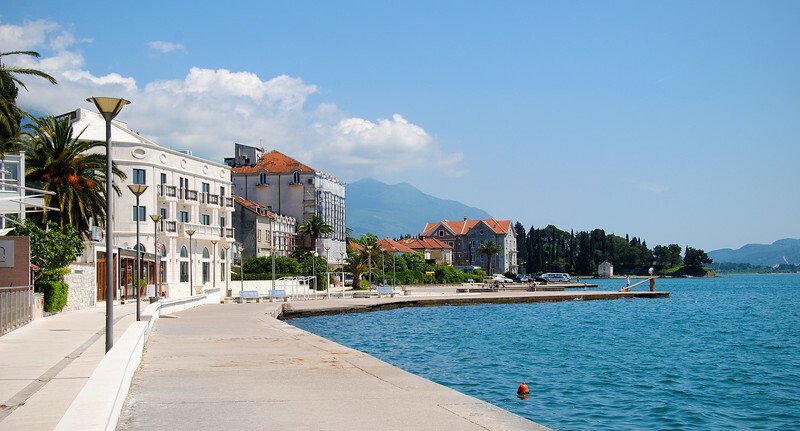 Montenegro was one of the six republics of former Yugoslavia. After the Iron Curtain fell, it federated with Serbia and only gained independence as a country recently in 2006. In fact, Neda's mom was born in Montenegro. Which is one of the reasons why we're here. We are on a mission from Neda's grandmother. 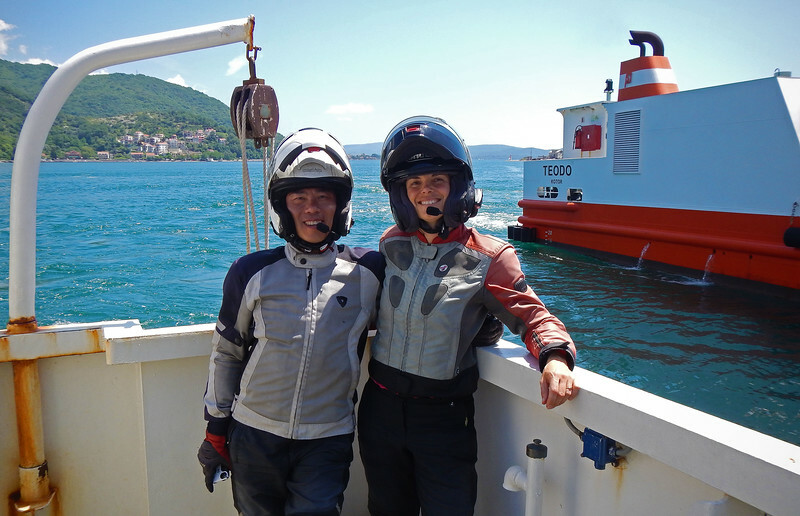 She grew up near Tivat, which is only 30kms away from the border. 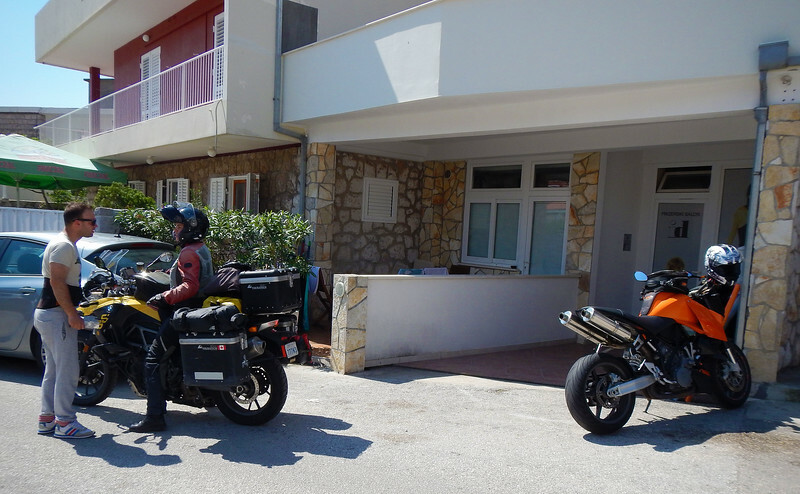 When we told her we were riding down the Adriatic coast, she asked us to take pictures of the town and the area where she used to live. She hasn't been back since and she wanted to see how it's changed. There's a narrow channel at the mouth of the Bay of Kotor that opens up into a larger lake. 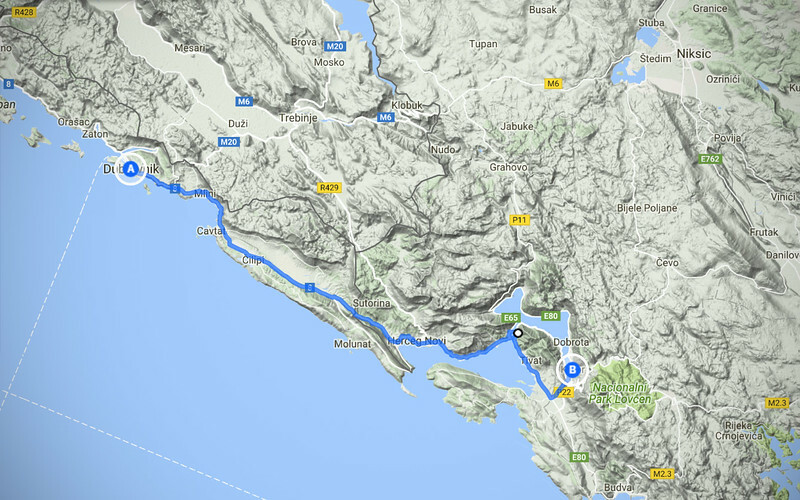 Getting to Tivat around the lake adds another 30kms. It's a great scenic twisty road around the circumference of the Bay, but we have a packed schedule today, so we catch the short ferry to bypass the route. It's only a 15 minute crossing, just long enough to take a quick pic and then back on the bikes! 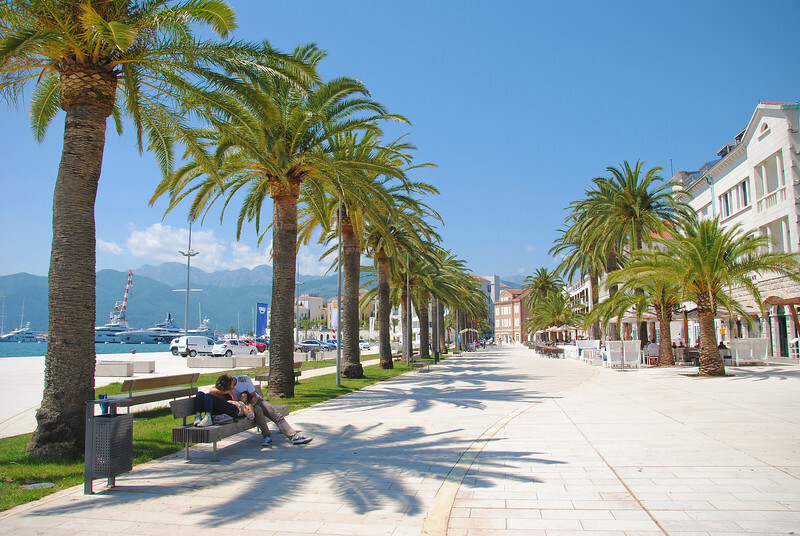 Tivat used to be a small town. 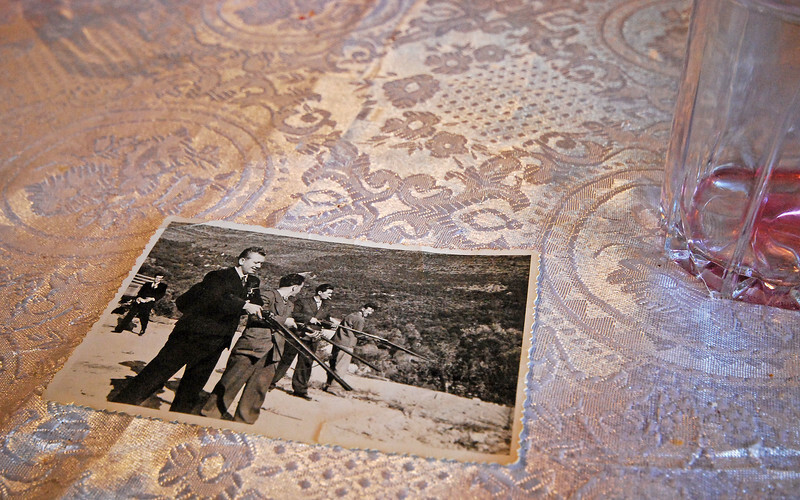 Most of the town was destroyed in an earthquake in 1979, after Nonna and Neda's mom left to Pula. 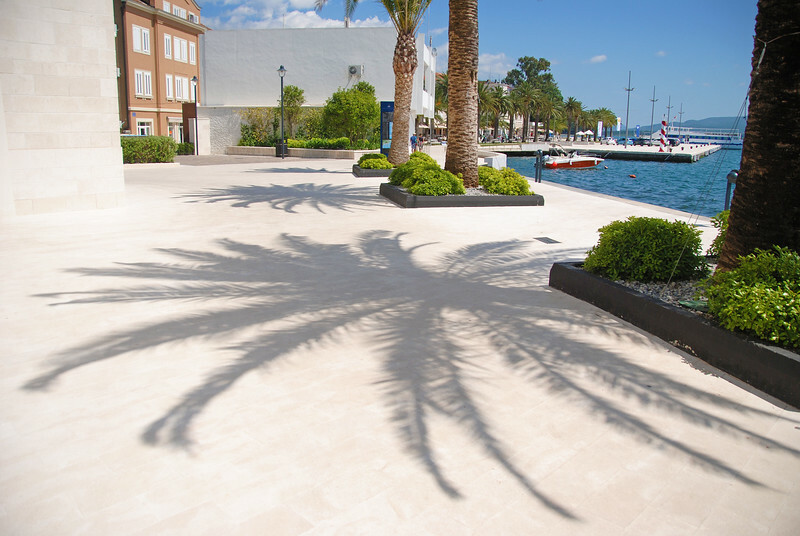 It's been almost completely rebuilt since and in recent years, it's developed into a large tourist port. 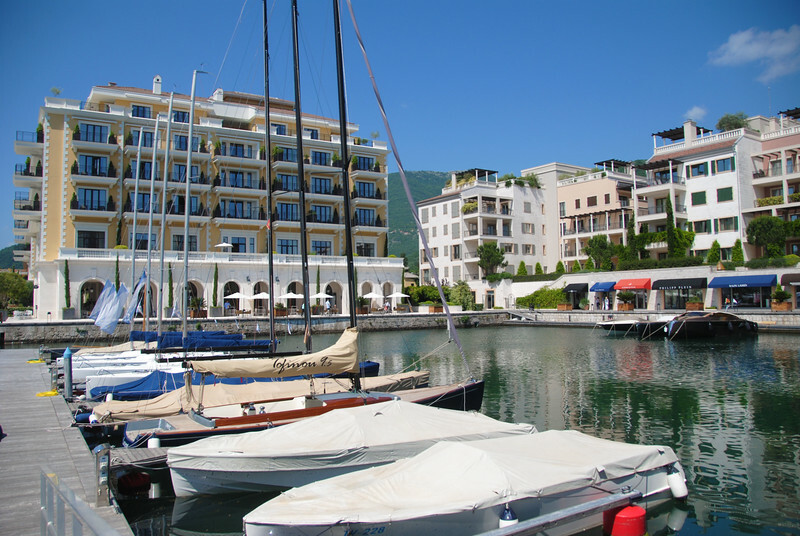 In 2014, a huge luxury yacht marina opened up called Porto Montenegro and then fancy restaurants and shops sprung up to cater to the Rolex and Ferragamo boat shoe crowds that hang out here now. We poked our heads into a few restaurants by the harbour. The maitre'ds looked us up and down from our dusty boots to our faded motorcycle jackets crusted in dried bugs and motor oil. In turn, we looked up and down the fancy leather-bound menus and couldn't find anything we could afford. But outside of the tourist centre, we found this amazing fish restaurant. 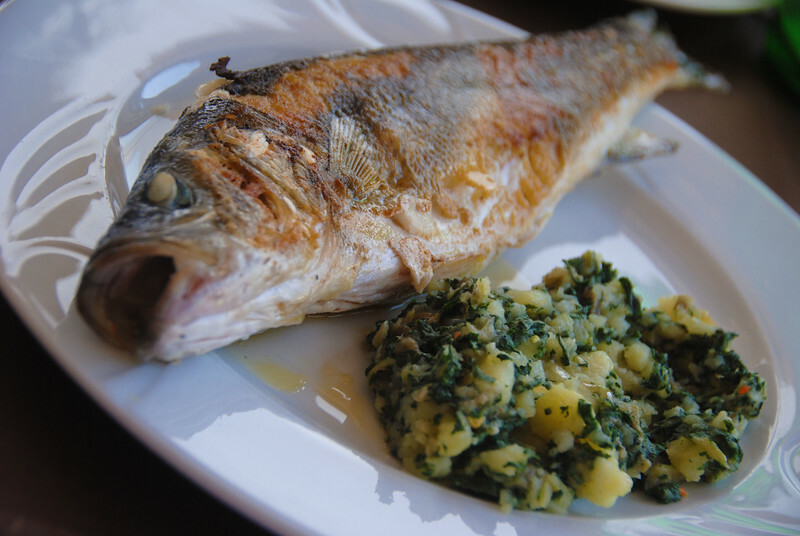 We had delicious sea bream for lunch with blitva (swiss chard), and the waiter didn't even check to see if we were wearing Rolexes when we walked in. Nice. 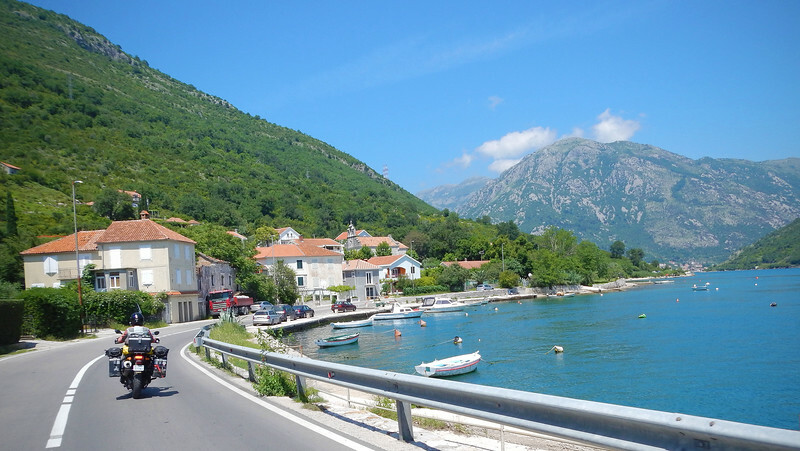 Our next stop for the day is a tiny town just a couple of kms outside of Tivat. This is where Nonna used to live and is where Neda's mom was born. We got the address from Neda's cousin. Or rather, we got directions - there are no addresses here. She told us, "Just go up the hill. It's one of the two houses at the top." Coming from a city boy, those are very vague instructions and I didn't really know what to punch into the GPS. So we just rode to the tiny town where Neda's mom was born. When we got there, we looked at the layout. There's basically one main road that goes right through the town. It then rises pretty fast up the hill, and the slope was very steep, so we were headed in the right direction. We passed a few houses on that road up the hill, and sure enough, just like Neda's cousin said, there were only two houses at the top. One house looked empty. A man in the other house watched us as we pulled up. So it turns out, this guy was her mom's cousin! The house still belonged in the family and Ranko uses it as a summer cottage. He actually lives in Split and it was entirely by co-incidence that he just happened to be up here this week. We were so surprised that he knew of us. 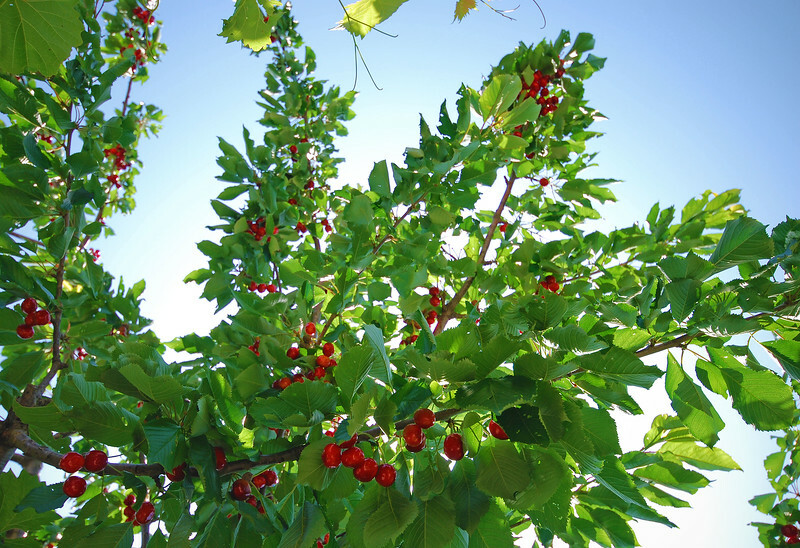 Neda has never met anyone on that branch of the family tree before today, but Nonna keeps in touch with him and keeps him updated on the family in Pula. Ranko showed us around the entire property, giving Neda the history of the place and telling her stories of him and Neda's mom. They were very close when growing up. Neda's uncle and Ranko's brother were the more rambunctious siblings and whenever the two families would visit, they would run off and play together. Ranko and Neda's mom were quieter, preferring to talk and read together, so they got along together. In every room of the house, Ranko would share more stories, "And then this is where your mom..." It's been almost two years since Neda's mom passed away. I know she misses her every single day and watching her listening to all these stories about her, I could sense that she was feeling closer to her, filling in the blanks and discovering more about her as a young girl. We spent over two hours with Ranko, soaking up all the family history. When it was time to go, Ranko invited us over again the next day. The entire family was coming up and getting together for lunch and he insisted we spend the afternoon with them again. Of course we would! The next afternoon, we're back again. 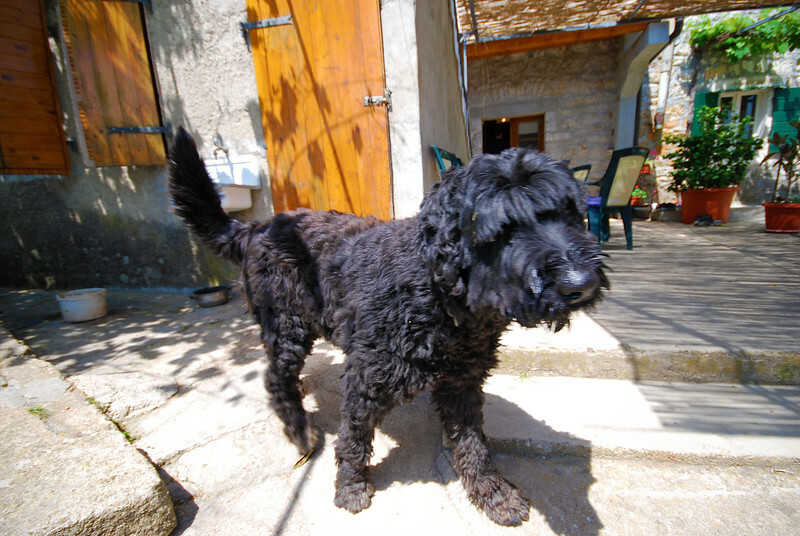 This time there's a family dog! This is Tamara, Ranko's wife. 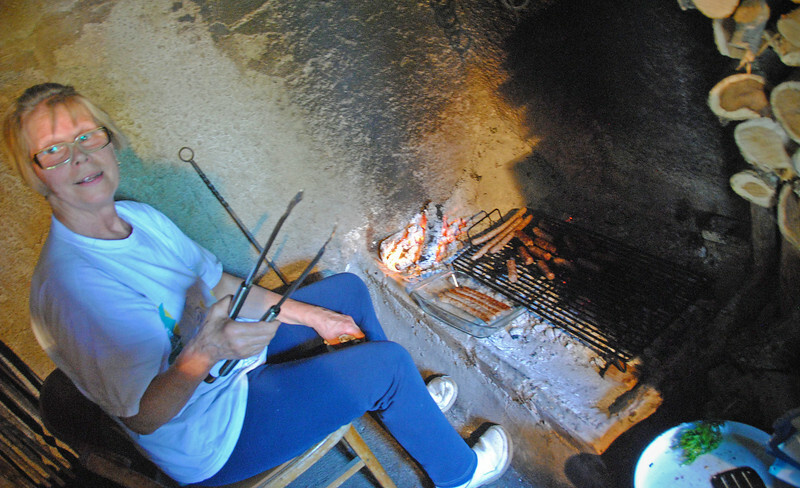 She's grilling some yummy traditional Croatian meats, ćevapčići. It's going to be a feast! 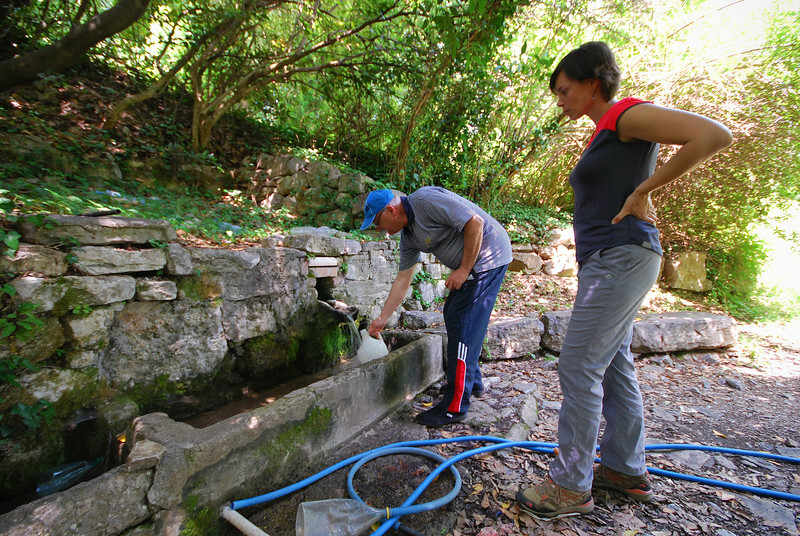 Nonna used to tell Neda stories of how she had to walk to the well every day to fetch water for the family for the day. So interesting seeing this in person. 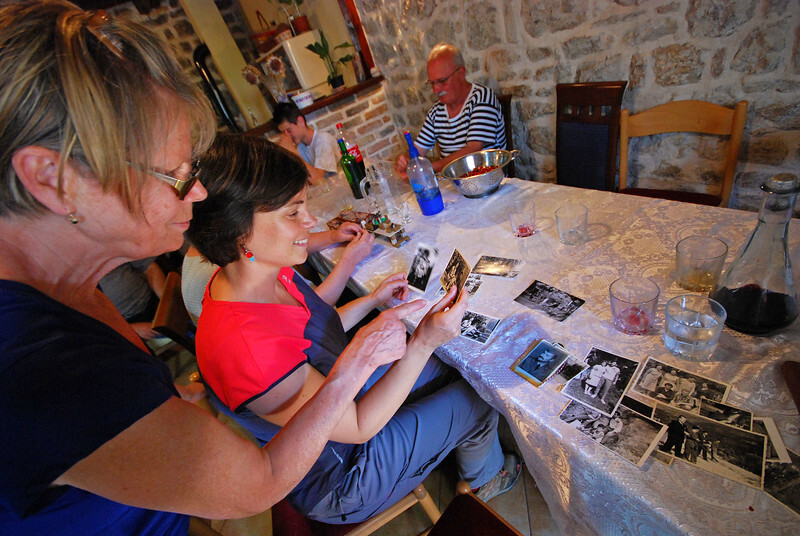 I took lots of pictures to show Nonna when we go back to Pula. I think she'll be delighted! I may not know a lot of Croatian, but most of the words I know are related to food. 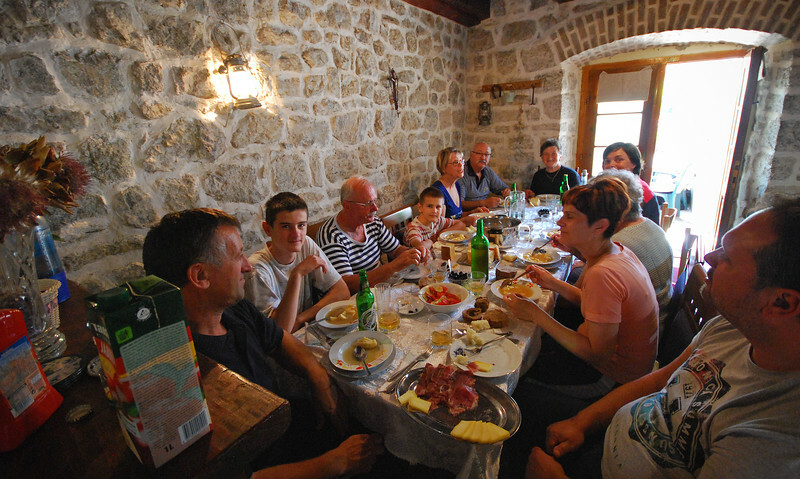 So I excelled here at lunchtime - impressing the entire family with my extensive knowledge of Croatian foods. "Then after the wedding, the guys went outside and shot guns to celebrate." We had such a great time hanging out with Neda's family. Before today, they just existed in stories that her mom used to tell her. 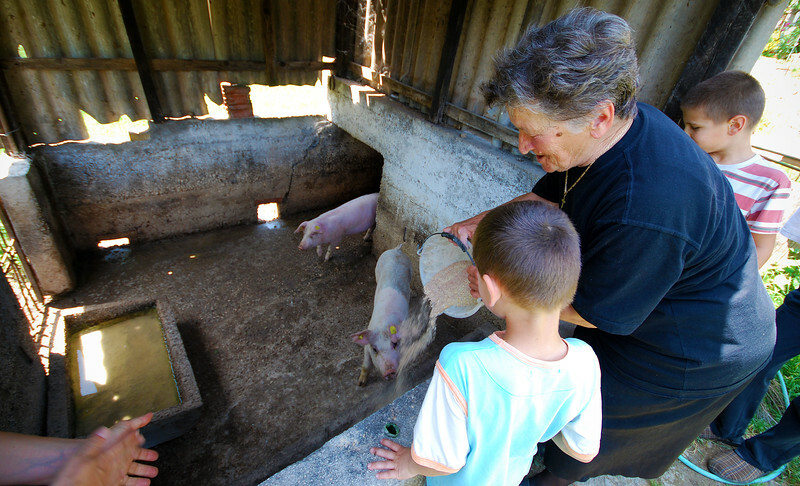 But they were so friendly and hospitable, treating us like they had known us their entire lives.